It was a bumpy ride at times, but Extreme Cage Fighting's "Rage in the Cage" - which packed the Mellrose Ballroom in Astoria with rabid fight fans on Saturday night - ultimately delivered the goods. Featuring a whopping 17 bouts of the grappling-, kickboxing- and MMA variety, the mammoth card saw all manner of action play out - not the least of which was Meredith Connelly's one-sided beating of a game but over-matched Shannon Grager. 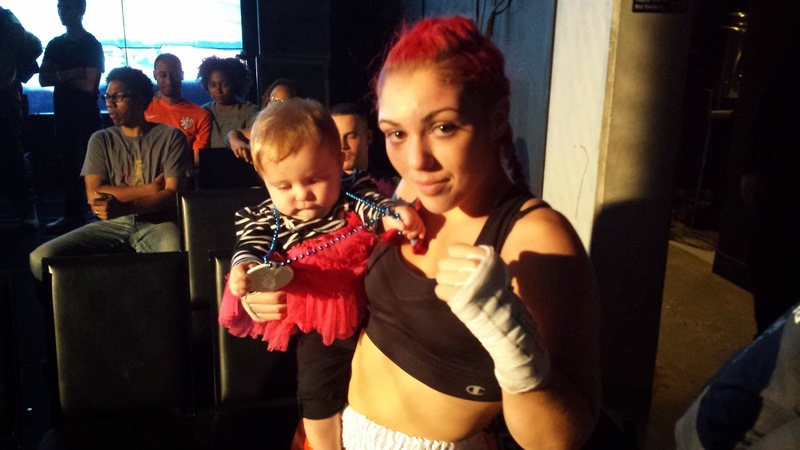 Immediately after her victory, Connelly exited the cage to embrace and hold her number one fan (see photo above). Former Manup Standup champ Will Cavali had his hands full with Matt Bonaventure, and after an accidental clash of heads opened a cut above Bonaventure's eye, emotions were high. Bonaventure took the decision when time ran out. In other action, crowd-favorite Eric Olsen returned to the cage after a recent MMA loss to take a hard-fought decision in a kickboxing bout against Jason Markland, while Rob McDermott took opponent Ortego Mack's best and returned it tenfold via a KO with just six seconds left in the round. As for the issues outside of the cage, they manifested themselves in the form of a miscalculated decision that had the wrong girl declared the winner after three rounds of taking a beating, as well as a decision rendered on what was clearly a referee stoppage. But despite the speed bumps, ECF's Rage in the Cage breezed along, and at the end of the night, fans seemed to leave the venue more than satisfied.